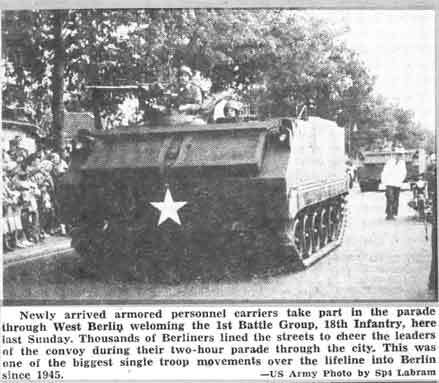 The 1st Battle Group of the 18th Infantry arrived in West Berlin last Sunday afternoon and paraded through the city to the cheers of thousands of flower-tossing Berliners. Ordered to Berlin by President Kennedy to beef up United States forces in the Divided City, the 1,500-man battle group moved from the Mannheim, Germany area in a 50-mile convoy of 491 vehicles and trailers to join their allies in isolated West Berlin. 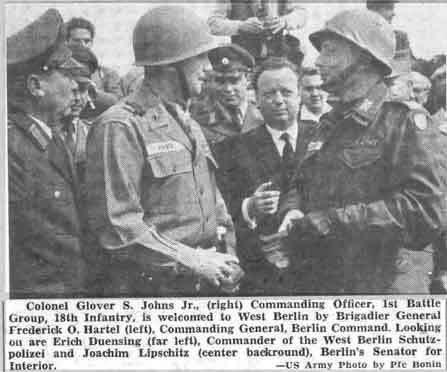 The battle group is commanded by Colonel Glover S. Johns, Jr., a 1931 graduate of Virginia Military Institute. 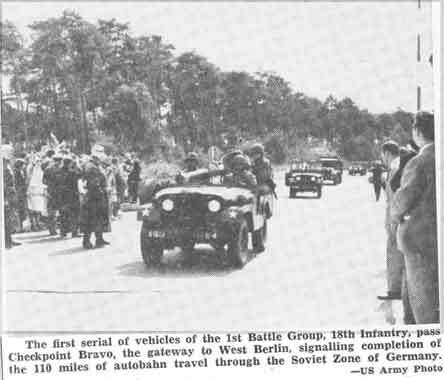 With the lead vehicle moving into the Soviet Zone of East Germany at 6:34 a.m. Sunday morning, advance element of the convoy reached Berlin at noon. Divided into five march units, the convoy from Helmstedt stretched over 100 miles of East German autobahn. Enroute, the convoy was under close observation by uniformed and plainclothes East German police. 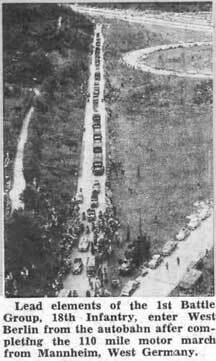 Half hidden, by trees and bushes, the “VOPOs” watched the convoy’s progress across communist territory. At the same time, a twin-engined Soviet jet patrolled the autobahn most of the time. The convoy was split into march units to ease the problems of command and control. Vehicles were cleared through the Soviet checkpoint a march unit at a time. The Soviets at the control point can look inside but not enter any vehicle. They also count the number of men, and compare the lists with identity cards. Just before the column spearhead moved into the East Zone, American, British and French military police and a West German border patrol man raised the flags of the four allied powers. The Berlin-bound infantrymen passed under the Hammer and sickle of communism as they left the Soviet Marienborn checkpoint. While the battle group was enroute, members of the garrison in Berlin spent a busy weekend preparing far their arrival. From early Saturday morning until late that night, work details from Special Troops, 2nd and 3rd Battle Groups, 6th Infantry performed the herculean task of arranging quarters and messing facilities. Things were all set before each march unit pulled in Sunday. Refreshed Monday morning after a good night's sleep, the first task for the newly arrived infantrymen was to remove the flowers Berliners had draped over their trucks when they rolled into the city. Since their arrival, officers and non-commissioned officers of the group have attended a series of orientation lectures designed t o acquaint them with their duties while in the Divided City. A spokesman for the group stated that routine training in Combat-in-Cities and riot control would begin as soon as their equipment was in shape.